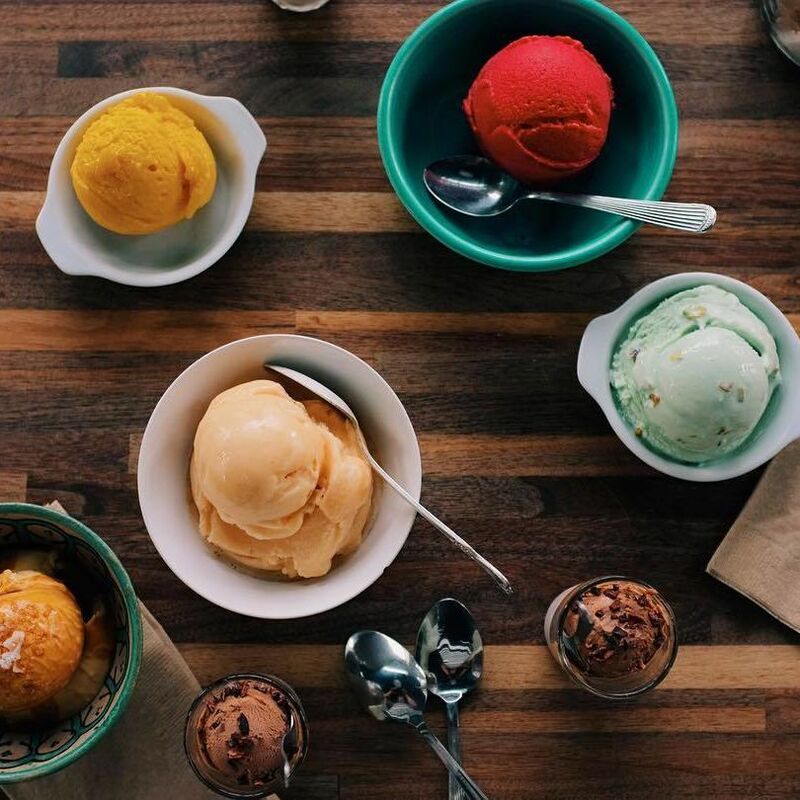 A miniature guide to Seattle's dessert scene. All-star cakes, cookies, pies, ice cream, and doughnuts abound. 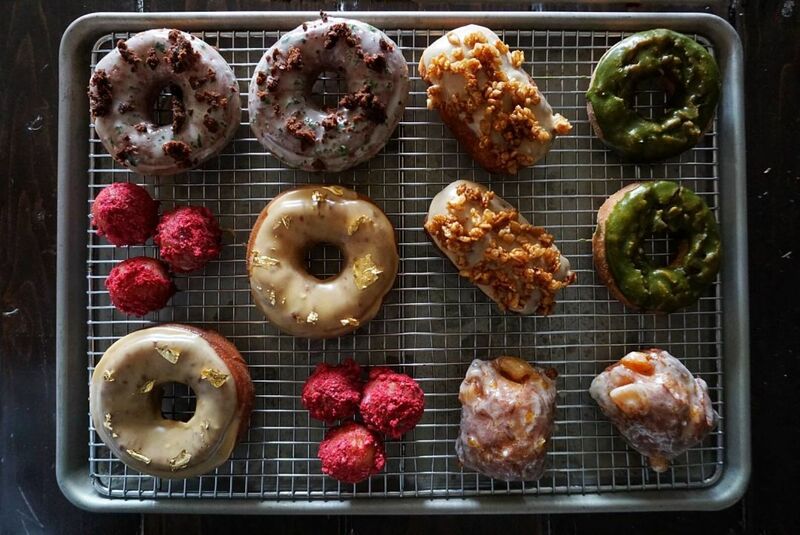 Glazed goods go beyond the usual favorites at Raised Doughnuts. In a former life 15 years ago, it was a Dunkin’ Donuts, hence the familiar looking signage with a pink, sprinkle-adorned doughnut. 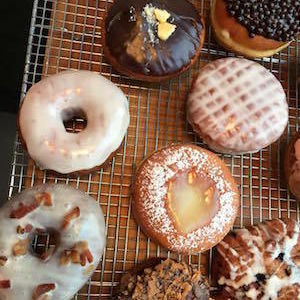 But today, this bakeshop situated in the northern reaches of the city fries its own doughy creations: honey-glazed doughnut holes, chocolate topped with chopped peanut, even a pleasantly crunchy, plain old-fashioned. Down in SoDo, among industrial warehouses and fast food chains, is this unassuming storefront that serves spicy pork bulgogi alongside apple- or lemon- or blueberry-filled doughnuts; a harmonious, if proletarian, combo. Smitten by the fried dough at St. John in London, Renee Erickson has created custard and cream-filled doughnuts in its image. The lemon curd is an especially bright and citrusy reminder that fried things can be wonderfully light and airy. 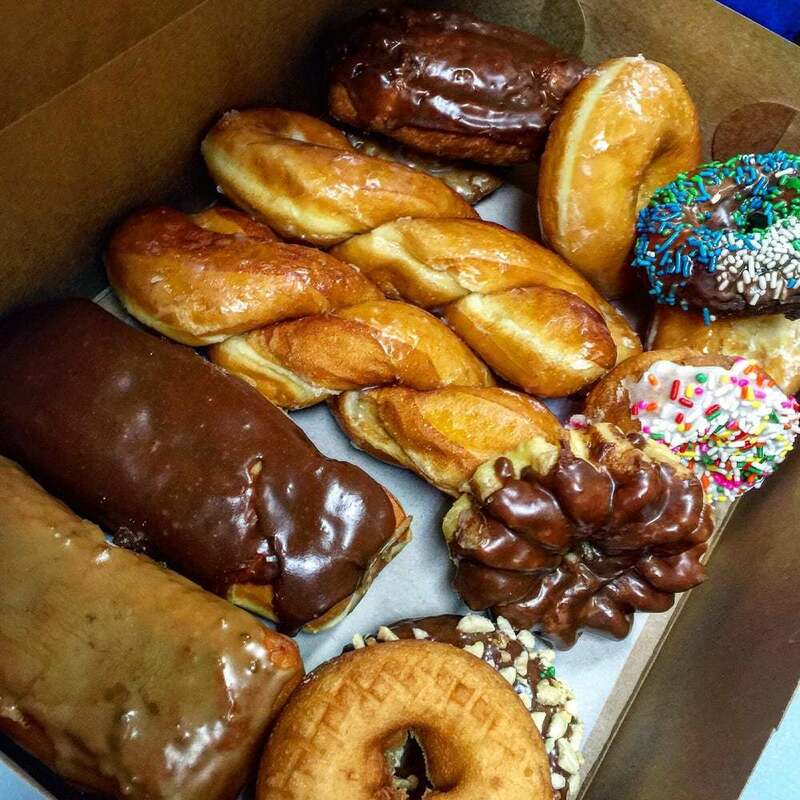 Erik Jackson’s White Center shop is a morning trifecta of classic doughnuts, coffee, and ice cream. Sugar and spice dominates but savory options abound, like boiled “p-nuts,” french bread pizza, and a three-egg and cheese breakfast sandwich. 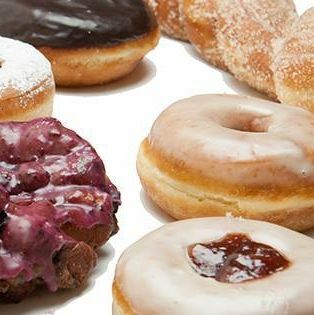 These doughnuts are vegan and organic, (also free of preservatives, trans fats, artificial colors, flavors, and cholesterol), but to focus on that stuff is to undermine how freaking wonderful they are. 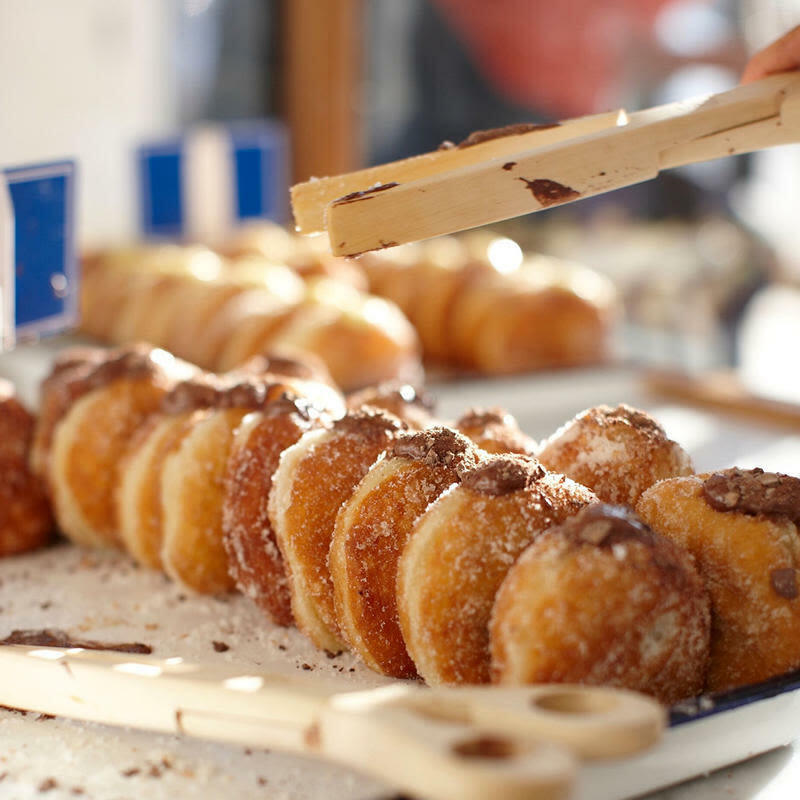 The french toast doughnut is at once both simple and life-changing. Baker Mi Kim and biz partner I-Miun Liu (East Trading Co., Oasis Tea Zone) have transformed a former Central District minimart into a cozy home base for Kim’s massively adored doughnuts. Regular favorites such as apple fritter, raspberry holes, and gluten-free mochi make appearances alongside flavors that change monthly—a caramel crunch bar, perhaps, or a Fruity Pebble–topped version. But take heed: Raised Doughnuts occasionally sells out before close. Work will always be there, doughnuts are fleeting. Inside Cupcake Royale, beyond its usual repertoire of baked goods and ice cream, find brioche-based doughnuts, upon which rich glazes cascade: the likes of blackberry balsamic, ghost pepper passion fruit, and dark chocolate topped with chocolate covered crispy “caviar” among them. In Seattle, what do people with piercings, diaper bags, blue hair, briefcases, bike shorts, Republican Party memberships, and On the Boards season tickets have in common? 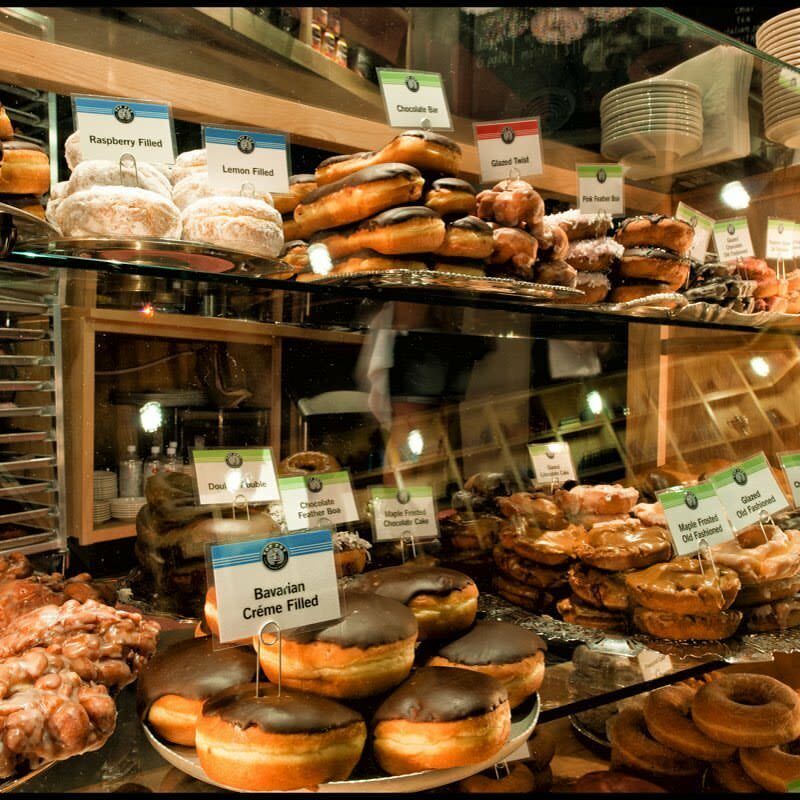 They all join hands and sing “Kumbaya” before Top Pot, the hip little Capitol Hill doughnut shop that has grown to a whole lot of retail outlets. Why all the love? 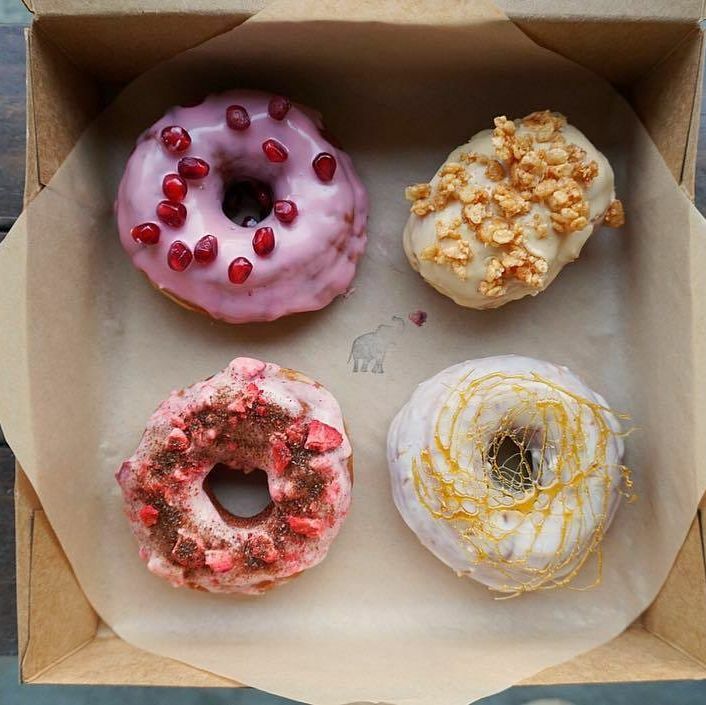 Exceptional doughnuts, crafted of real ingredients, decorated into joyful little parties (try the Pink Feather Boa), and served with really fine coffee. Simply the biggest jones in town. Lowrider slings brown butter triple chocolate chunk, s'mores, and birthday cake cookies. A bakery that just does cookies? This 19th Avenue spot sounds so simple, but owner Robin Wehl finds the sweet spot between homespun and creativity: Salted butterscotch. Oatmeal chocolate chip with tart cherries in lieu of raisins. The mackle’smore plunks a s’more cookie on top of a graham cracker, and the birthday cake cookie sports enough sprinkles to garnish an entire sundae. Hello Robin has a Molly Moon’s counter inside, so you can concoct all manner of cookie-ice cream sandwiches. In October, Emily Allport’s roving cookie bakery moved into the Georgetown Trailer Park. Most of her cookies are broad and relatively thin, with just the right dash of surprise: In the fall, caramel apple snickerdoodles are properly chewy. 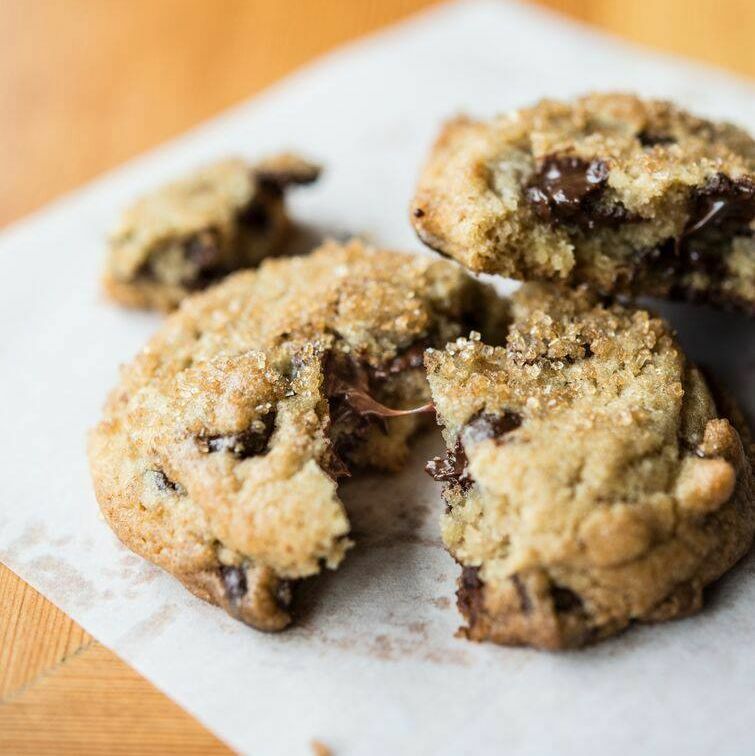 Brown butter triple chocolate chunk is your classic chocolate chip, graduated from finishing school. 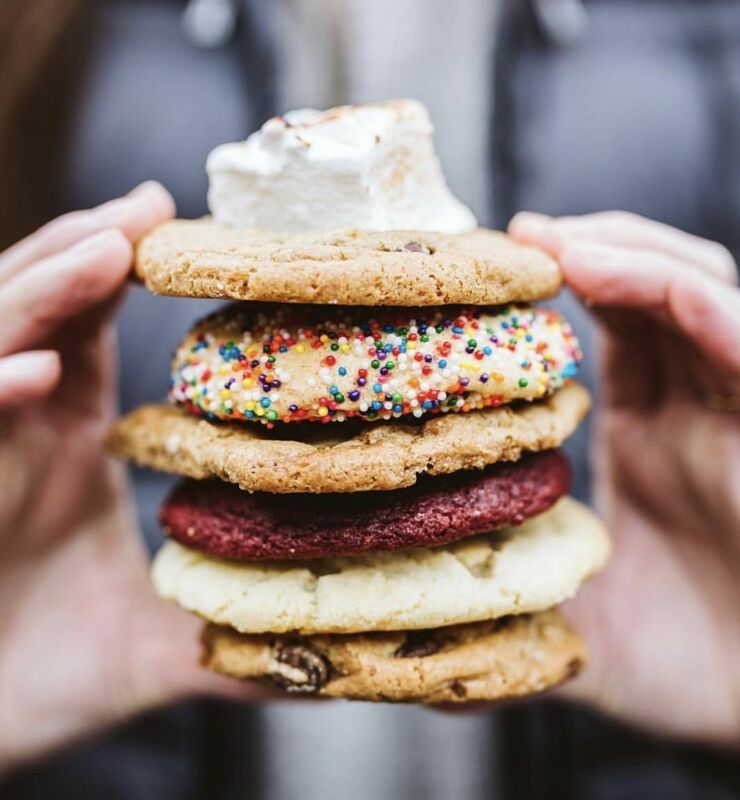 And the cookie craze continues to spread: Come May, Allport will open a brick-and-mortar location in the Central District. Deep Sea Sugar and Salt's Charlie Dunmire sure knows how to layer. 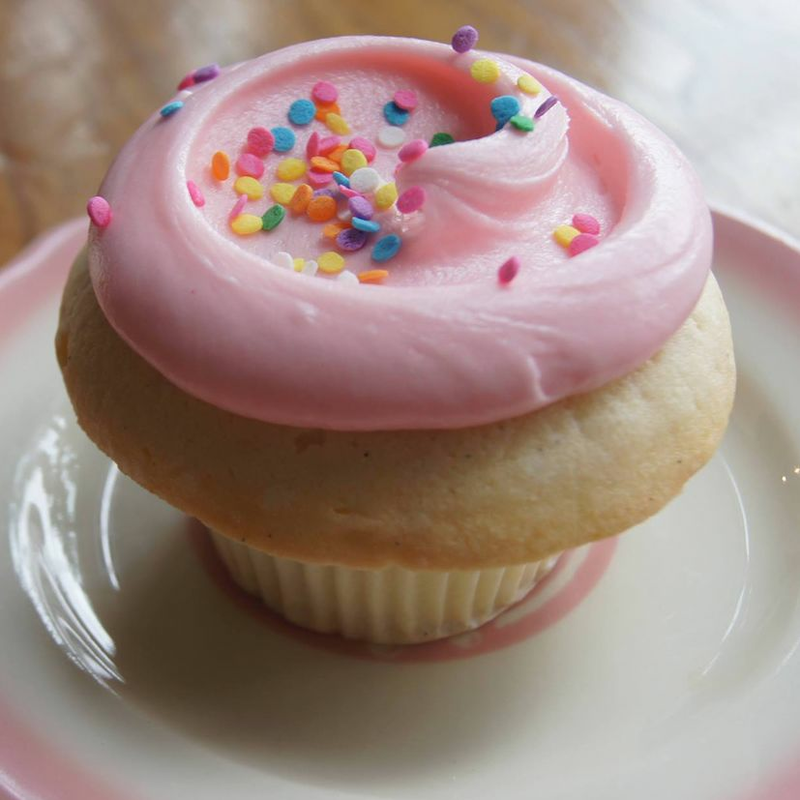 Cupcake Royale's buttercream-frosted wares dwell inside its many baby pink–hued outposts that dot the city, among those flavors: whiskey maple bacon, salted caramel, red velvet, tiramisu, classic vanilla, and more. 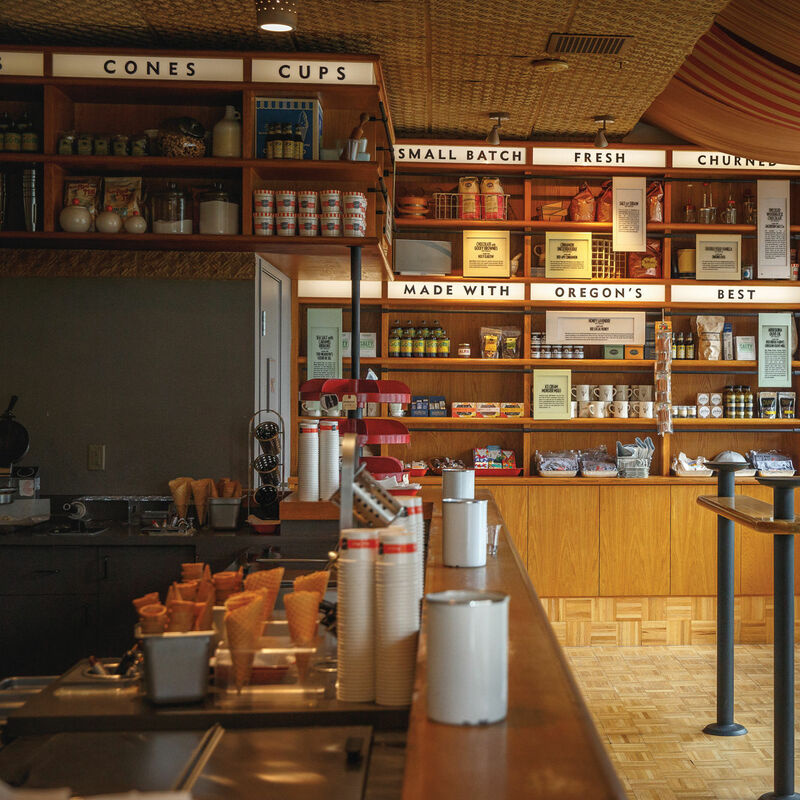 While the cafe originally trafficked in cupcakes and espresso, owner Jody Hall started churning housemade ice cream—long before Salt and Straw graced our dining scene, by the way. Flavors were developed with help from her good old friend Kim Malek—you know, cofounder of the beloved, Portland ice creamery. Behold such frozen creations as cheesecake with red velvet cupcake chunks and caramel ribbons swirled alongside roasted banana and hunks of brownie. 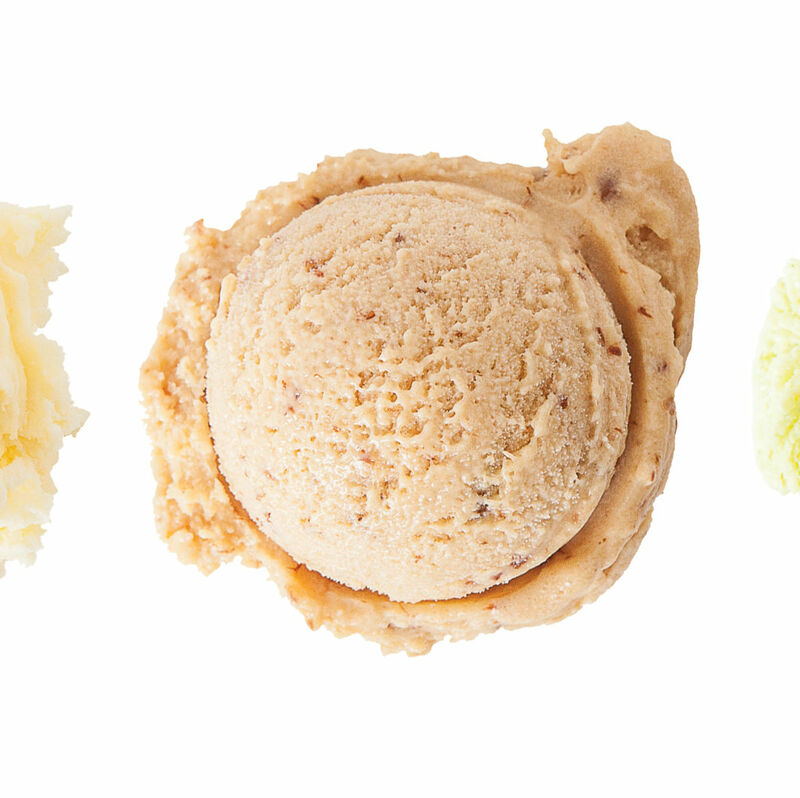 Plus, you can order four-scoop flights. Baker Charlie Dunmire, who recently graduated from Airstream trailer to a charming brick-and-mortar shop in Georgetown, fashions towering beauties like a ginger-molasses cake, its nine layers soaked in a syrup of stout and molasses. Or a s’mores-inspired confection layered with ganache and crowned with toasted whitecaps of marshmallow. Pints of Sweet Lo’s ice cream are available for purchase so you can double down on the sugar rush. For the uninitiated, ube sounds more like a car-sharing app than the sweet, violet yam that it is. Yet, it’s the exact ingredient that helped amass a cult following for Hood Famous Bakeshop, a small, subterranean bakery off Shilshole Avenue in Ballard. 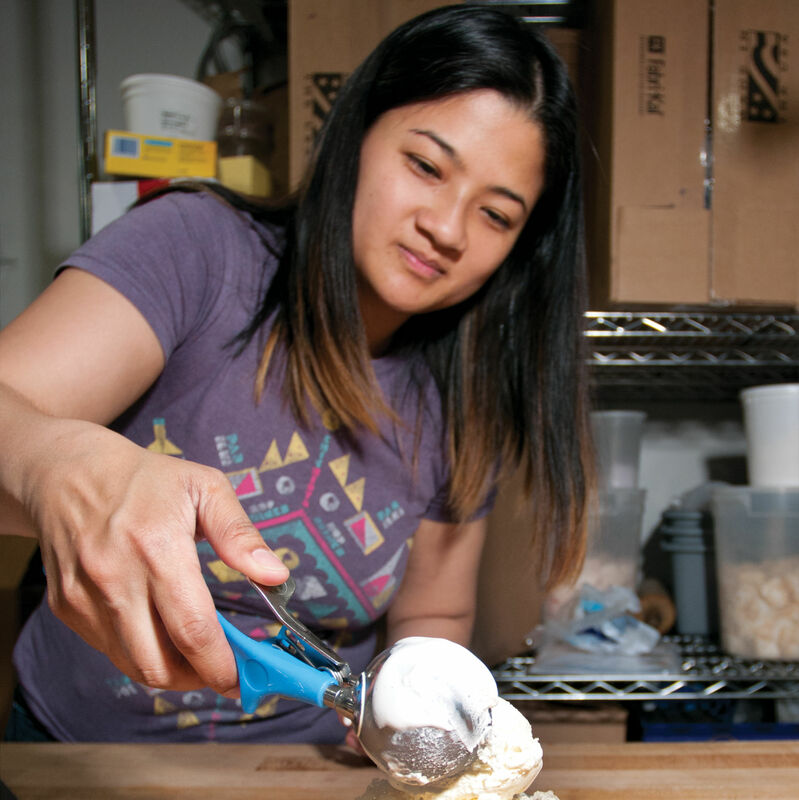 Owner Chera Amlag bakes cheesecake, but tempers its classic Americana with a Filipino touch. Back in 2016, Amlag opened a permanent home for her heretofore “hood famous” cheesecakes, which these days are known citywide. She bakes a whole slew of flavors beyond the signature ube that are rooted in the Filipino palate: white chocolate with rosy-pink swirls of guava, mango with calamansi (ubiquitous citrus in the Philippines squeezed onto just about anything), and a whole lineup of other non-cheesecake delights. A new cafe in Chinatown keeps up the favorites and by evening adds cocktails with tropical notes of the Philippines. Dovetailing Seattle’s loves of mason jars and refined spins on sweet American standards, Hot Cakes offers argument that dessert needn’t be an afterthought. 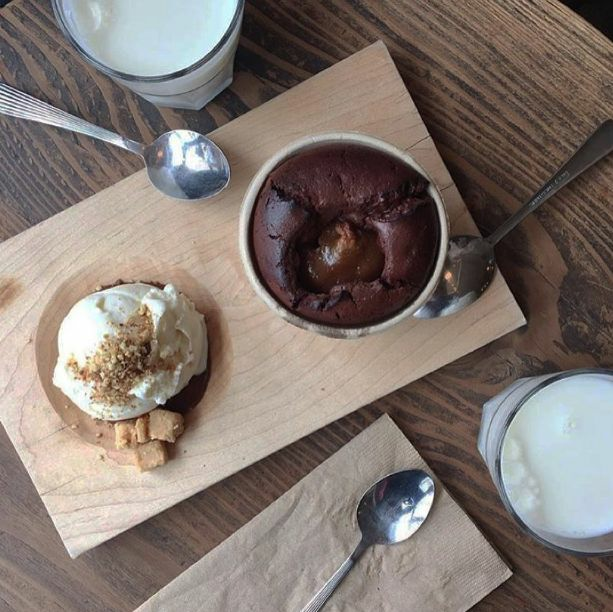 Hit the Ballard or Capitol Hill cakery and try one of the eponymous molten cakes (chocolate, peanut butter, hazelnut). 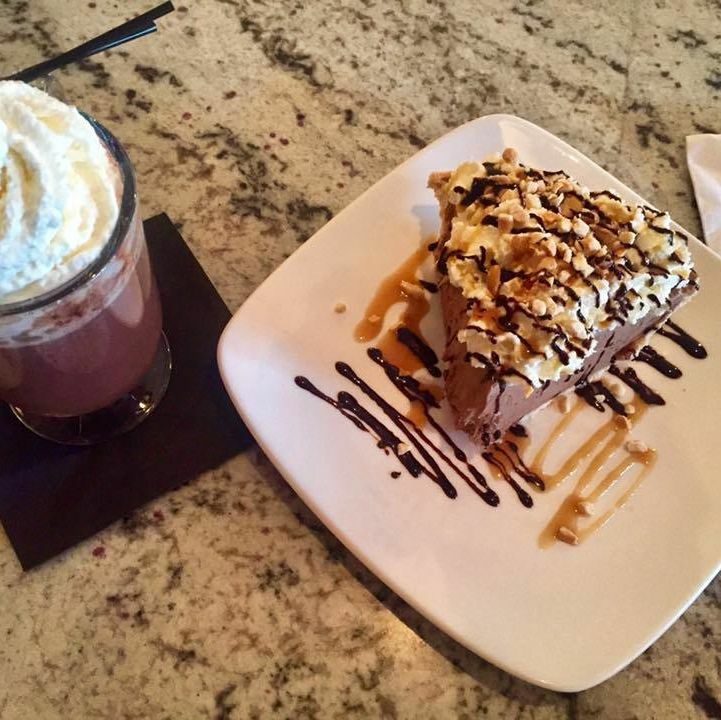 Broodingly dark chocolate flows freely here and fittingly, for few in Seattle take dessert so seriously. For bakeries the goal, usually, is to be expansive and multitude in your baked goods—sweet and savory; diminutive pastries and impressively tall cakes; styles and shapes of any sort. 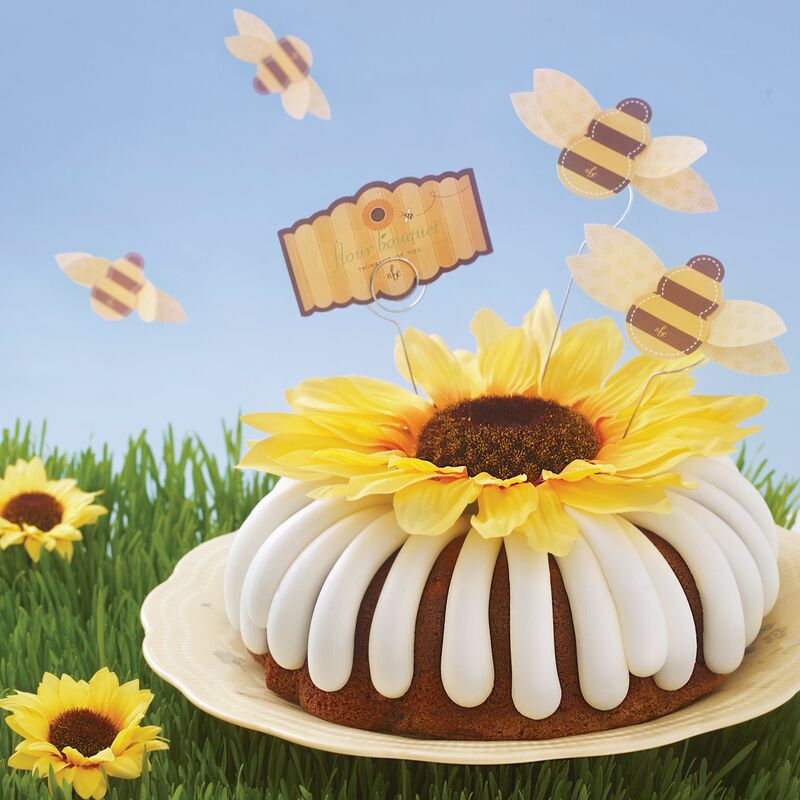 Yet Nothing Bundt Cakes banks on its eponymous treat (and dad-joke styled pun). At its Mill Creek and Issaquah locations a pastry case is stocked with domed bundt cakes in flavors like red velvet and lemon all piped with cream cheese frosting. 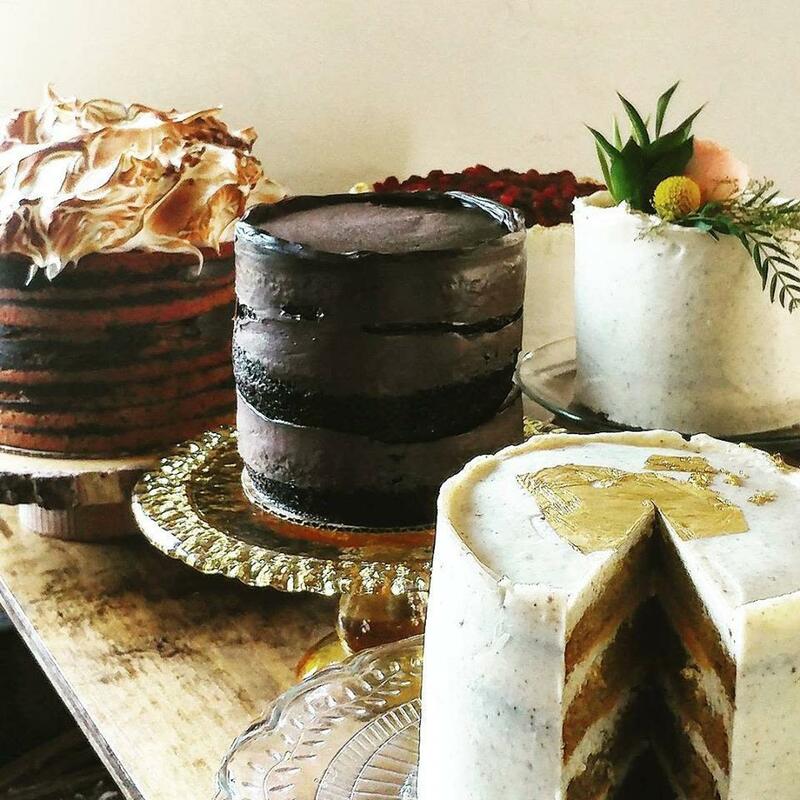 The Sugar Bakery and Cafe was spun from a husband and wife’s experimentation with the apples from a tree in their front yard, but they didn’t stop there: pumpkin mousse cake, chocolate truffles, and toasted coconut cake show they’ve moved well past the apple tree. 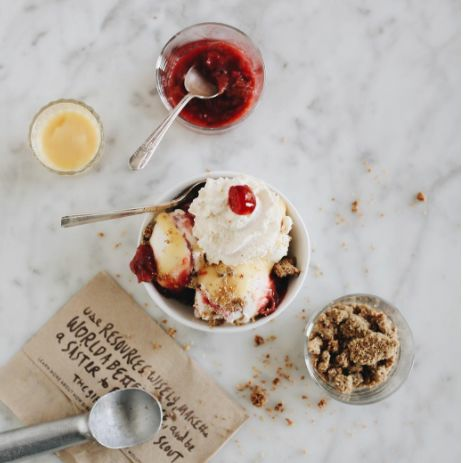 Salt and Straw has a handful of tailormade ice creams featuring local ingredients in each city. This is the place to go when you want Elysian stout in a cone. The Fremont location boasts a cool vintage soda fountain and a lineup of floats to match, while the outpost on Greenwood Avenue incorporates a mini brewery for beer floats. One last important note: snickerdoodle ice cream forever, amen. Juicebox’s Kari Brunson and Hot Cakes founder Autumn Martin created a lineup of vegan ice cream that’s crazy decadent, deeply flavored, and in no way a dietary consolation prize. 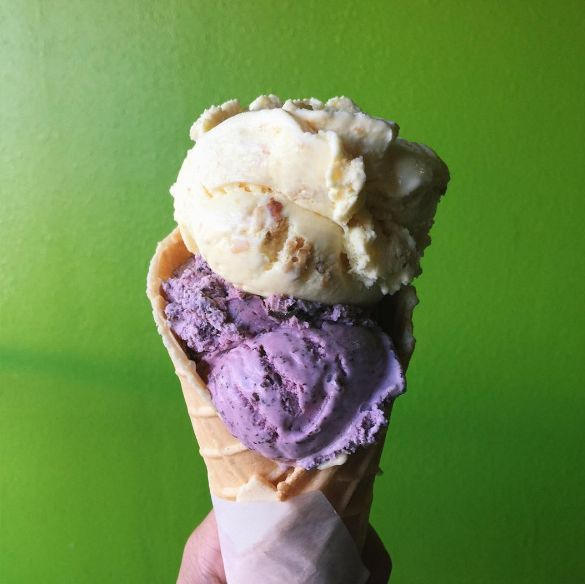 Their scoop shop serves frequently rotating flavors, like brown sugar vanilla, gingered golden milk (which tastes, in the best possible way, of pure ginger), and salty caramel ash that’s sweet and salty and the color of a thunderstorm cloud. 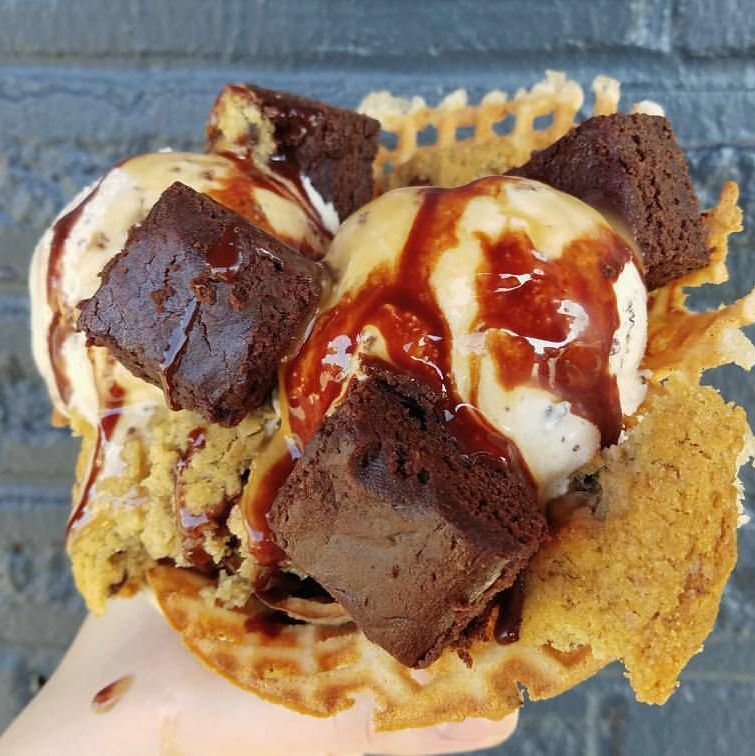 Ice cream comes in a cup or gluten-free vanilla-maple waffle cone, and you can top them with things like chocolate sauce or moon goo, the housemade caramel sauce. Marvel at owner Justin Cline’s peculiar but brilliant formula: pinball plus beer plus ice cream. Cline takes his game selection as seriously as his flavors, which can vary from Vietnamese cinnamon to mango chili to root beer (bonus points for vegan flavors that aren’t lame). A visit to any of Full Tilt’s five locations will probably feature a raucous soundtrack, a short but solid beer list, and the incessant plingplingpling of arcade games. Really, it’s more “world’s most wholesome dive bar” than “treacly sweet shop,” but we’re glad it’s a little bit of both. The seasons of Kurt Timmermeister’s Vashon Island dairy farm drive the bucolic creations at his counter in Chophouse Row: salted plum, Sichuan peppercorn, and glorious ice cream versions of his famed Flora’s Cheese, which is a lovely, savory departure from the typically too-sweet flavors of grocery aisles. While we certainly have cupcakes covered, Seattle once fell short when it came to the cold, creamy stuff. (Those were dark days.) That all changed with the opening of Molly Moon’s Homemade Ice Cream in Wallingford, now a full-blown empire with outposts all around town. 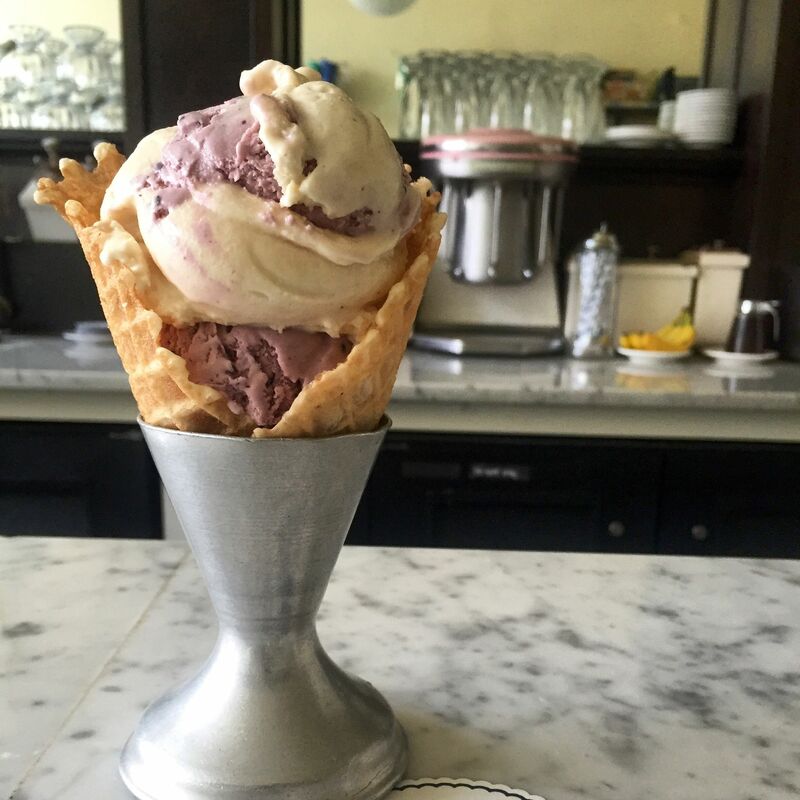 An 11pm closing time and flavors like balsamic strawberry and Stumptown coffee hinted that owner Molly Moon Neitzel wasn’t just catering to the kiddies; a whopping 19 percent butterfat content sealed it. Her rich scoops turned out to be well-balanced, complex confections that transform the most sober adult into the kind of obsessive who runs after ice cream trucks (again). Adria Shimada makes her own ice cream base from scratch and grows her own spearmint for the vividly herbaceous (but not the traditional artificially green-colored) mint stracciatella. Which is to say, she’s about as artisan as ice cream gets, though flavors skew more homespun—dark chocolate ice cream with bits of housemade peanut butter cup, blackberry, and the purest strawberry ice cream known to mankind. 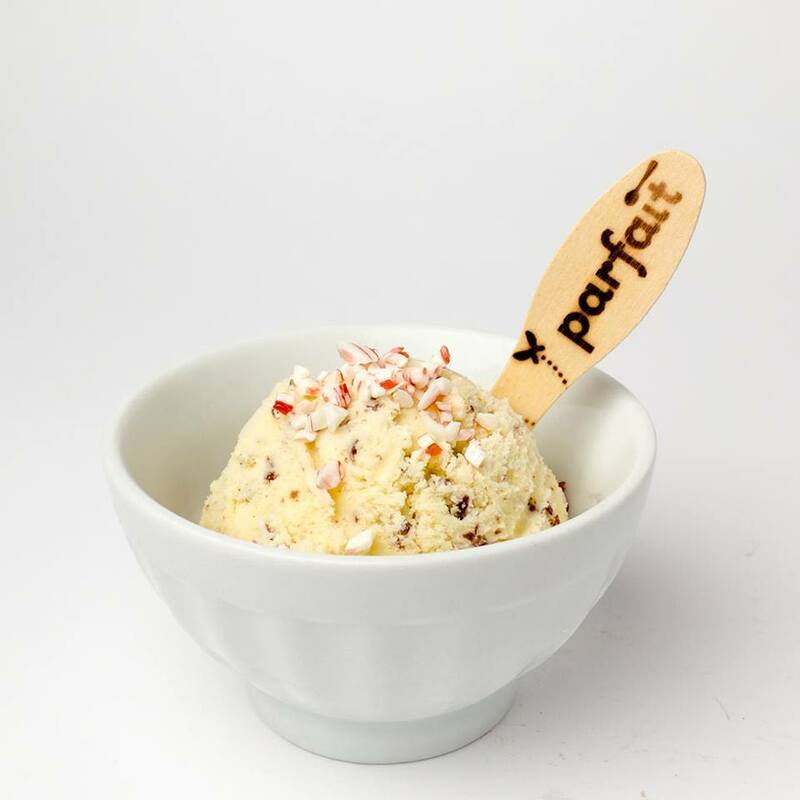 Parfait’s cheery Ballard atelier also sells push pops and macarons filled with ice cream, but the neighborhood’s favorite is the smooth coffee ice cream, fueled by True North Coffee Roasters, with chunks of housemade Oreo. 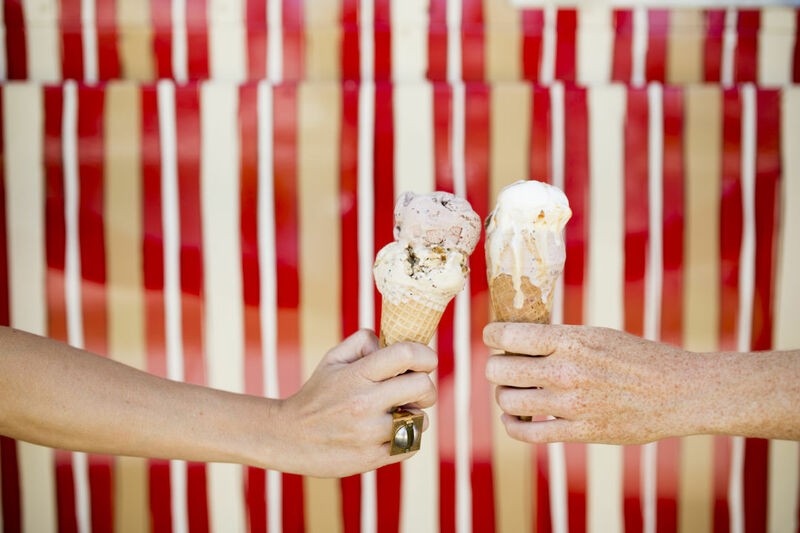 Cousins and owners Kim and Tyler Malek founded Salt and Straw in Portland in 2011, dispensing flavors that take people on a roller coaster ride—the sweet, nostalgia-hitting highs, the gasp-inducing drops into savory notes. And much like thrilling attractions, Salt and Straw tends to draw lines. People are known to queue down the block to get a taste of whatever experiments Tyler, the flavor nerd of the pair, has churned into creamy goodness. The ice cream at Georgetown's Seattle Freeze is a bit of a hybrid that’s halfway between scoop ice cream and soft serve: a machine takes an ice cream base, incorporates add-ins, and then churns it all out in flavors like pineapple mint, coconut, and chocolate black sesame. 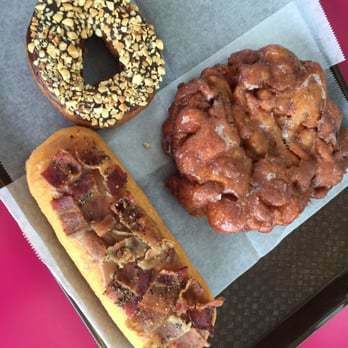 On the non-frozen side of things, husband-and-wife duo Darren McGill and Kryse Martin-McGill partner with the folks behind Big Boys and Poke Wai, slinging a variety of doughnuts—some cake, some raised, and some custard-filled—styled with homemade glazes and toppings. Vegan champion Makini Howell doesn’t spread the plant-based gospel through savory dishes alone, oh no. The restaurateur’s quaint sweet shop dispenses soft scoops of seasonal delight: hibiscus cherry ginger, rhubarb orange blossom, and avocado lavender with black pepper, which isn’t too floral or spicy but balanced despite its atypical combo. A whole lot of lattice. This cozy bakery on Phinney, across from the zoo, houses an actual brick-and-mortar operation for pie maestro Chris Porter, who spent his first years creating pies for delivery only. That’s how he built his reputation for exquisite pie—tart key lime, the apple and ginger and pear, the coconut-kissed blueberry—all encased in careful, glorious, buttery crusts. A slightly larger location in West Seattle adds a lineup of savory pies and tarts, housemade ice creams (boozy shakes! ), and dinner service. 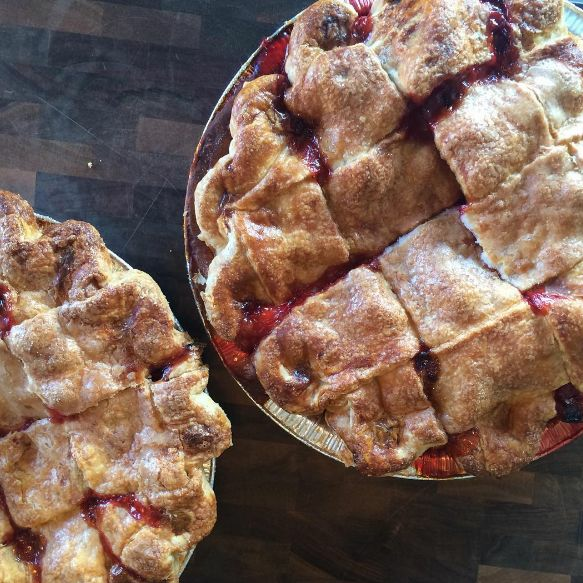 Bill Hart’s Southern-style pie shop isn’t just homey, it’s actually located in a house. The converted residence between two busy arterials even has a sign asking visitors to keep their feet off the chaise lounge in one of the side rooms. Another good rule at the Mt. 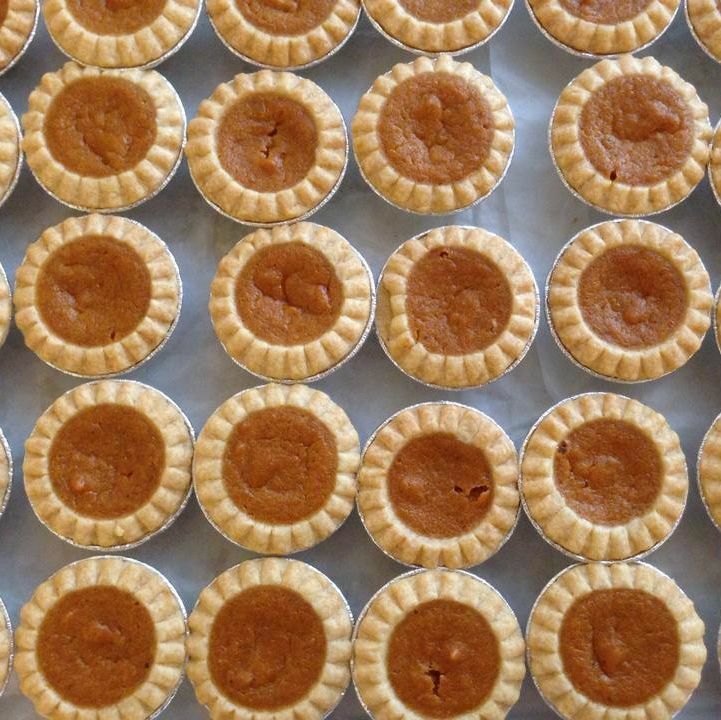 Baker store is to purchase whatever the friendly counterperson tells you is fresh from the oven, whether it’s old-fashioned bean pie, chess pie, or the velvety, down-home sweet potato. It carries just the right amounts (meaning less than most versions) of sugar and spice. My God, the pie! There’s a piemobile and a Fremont shop no bigger than a minute, so lucky for you these minis are handheld and portable, and filled with goodness from cinnamon apple to savory chicken to a legendary key lime. Crusts are fine but the fillings really are the headliner here; every day you’ll find the same handful of sweet and savory classics—including the three mentioned above—but dozens of others rotate through. French toast cream, anyone? A sweets-and-cocktails specialist in the thick of Capitol Hill that’s all about pie. What not to bring: a party of four (I mean it’s teensy), your children (it’s licensed as a bar), a liquor snob (they don’t call these creamy cocktails rimmed in streusel Pie-tinis for nothing), or a big-dinner appetite (savory pies are limited in number, blandly spiced, and diminutively portioned). 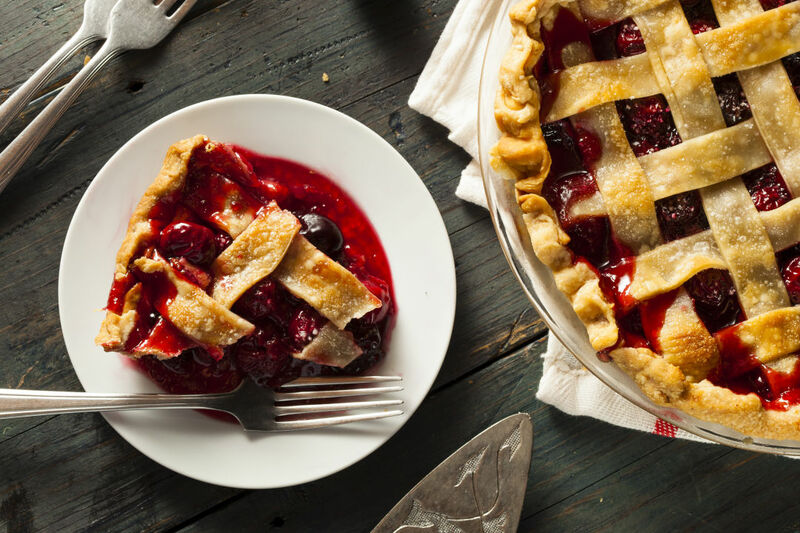 Do bring a sweet tooth for the half-dozen-nightly varieties of dessert pie, built proudly on leaf lard crusts, which explains their extraordinary richness and flake. A second location in Ballard has a similar pie-booze lineup, similar late-night hours, a similar takeout window, even similar recipes—but it's about three times the size and able to sell whole pies. 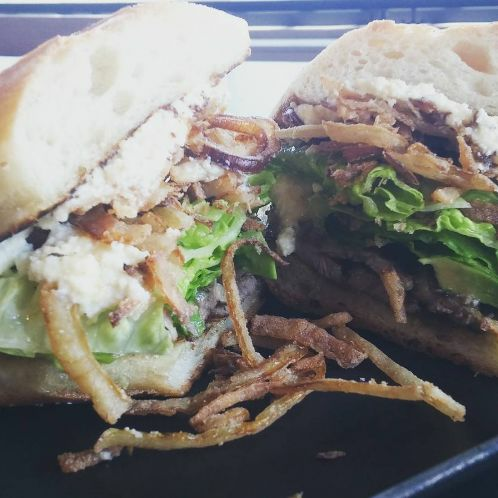 Around the corner from and sharing a kitchen with John Sundstrom’s magnificent Lark is its daytime takeout sibling, dedicated to the reinvention of sandwiches and pie. About a half dozen of the former are on hand any given day, including things like short rib meat pies and English muffin breakfast sandwiches and gluten-free flatbread. Pies are equally various and sure handed, with offerings like caramel apple pie between slabs of biscuity pie crust that exist at the corner of divine inspiration and butter.